How close to saturation is the smartphone? The US is not the market where penetration is highest. However, it is the largest market where we have reliable penetration data (from at least two sources) and the one where penetration is near the top of the range. The graph showing the US ranked against others as of a year ago is here. The US was cited at 56.4% at the time. I keep track of comScore’s data and it showed 58.2% at the end of March and 55.3% at the end of January, making the figure very believable. The most recent data from comScore shows penetration at 68.8%. In order to understand what the limits of that growth could be it’s important to see the longer-term pattern. It would show whether there is a clear point of inflection and thus a predictable “saturation” around an asymptotic value. 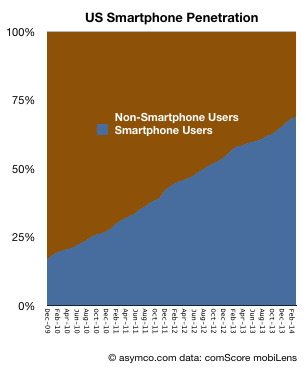 The following graph shows the percentage of smartphone users/non-users since late 2009. To summarize, the conversion of users from non-smart to smartphone usage is fairly constant. The March ’14 period saw 2.8 million new-to-smartphone users. the March ’13 period saw 3.0 million, the March ’12 period saw 2.0 million and March ’11 saw 3.0 million. There is no discernible slowing of adoption. Note that I added a trailing three period average in new users which fluctuates somewhat predictably due to seasonality. Finally, note that the figure of 50% penetration was reached almost two years ago and no noticeable change of adoption has happened since. Cellular phone ownership in the US is still rising (though very slowly) and it now about 90%. The only conclusion is that even at the current 68.8% penetration, we are not anywhere near “saturation” of smartphone users in the US, and the US is a leader among “developed markets” so there is little to suggest that saturation has happened anywhere with significant populations. › Next Post How close is the UK to smartphone saturation?